Takes the worry out of taking medication. 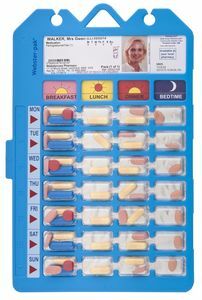 Our team at Creswick Pharmacy can pack you an individual Webster-pak, which puts each of your medicines in a dose for each day of the week and time of the day. You know exactly what to take at breakfast, lunch, dinner and bedtime. Gives peace of mind to patients, relatives, carers and loved ones. Speak to our pharmacists today to see if a Webster-pak might make taking your medicines at the right time easier.